On Tuesday, 27 November, people around the world will open their hearts to help Mercy Ships for Giving Tuesday, the international day of charity that launches the Christmas season. Our hospital ship, the Africa Mercy, is currently docked in Conakry, Guinea, where there are just three hospital beds and one doctor for every 10,000 people. 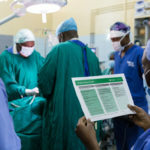 This is drastically different than our medical system here in the UK, where we simply don’t have to worry about whether we can get the safe, affordable surgery that we need. In Cameroon, and in all the places where Mercy Ships serves, our hospital ship presents the only hope for patients to receive vital, life-changing medical care. This Giving Tuesday, will you give free, life-changing medical care to more people in Guinea? Thanks to a generous matching donation, every pound you give will work twice as hard, healing more patients and changing more lives. Start a fundraiser on Facebook.It’s simple: Just start a new post, select “Support Nonprofit,” locate Mercy Ships UK and share a few words about why you’re supporting us on Giving Tuesday. 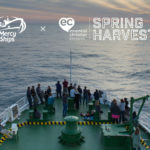 Share Mercy Ships stories on social media. Help us spread the word about the work Mercy Ships is doing to change the odds for people in need. For example, you could share this video about a mother and daughter who suffered from the same tumour — until your support healed them. 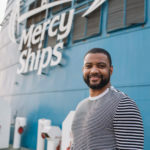 Tell a friend about Mercy Ships. Whether it’s a friend from the gym, a colleague or someone in your church, let them know about the important work of Mercy Ships. You could even encourage them to sign up for our email updates! Keep Mercy Ships in your prayers. 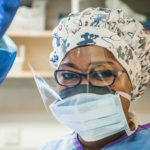 We ask that you pray for the health and safety of our patients, volunteers and our supporters, all of whom are critically important to our mission to provide life-changing medical care in Africa. No matter which action you take, thank you for supporting Mercy Ships. 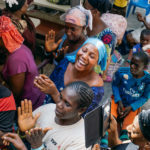 We’re so grateful that you’re part of our community, and we thank you for bringing more vital, life-changing medical care to Africa this Giving Tuesday.